If you are interested in having a logo designed, please contact me. Prices start at $50 for a logo. I have been working with Photoshop for a number of years, now, and I really like designing graphics. Just like a few other services I offer, designing logos started with a simple request from a client, and I enjoyed tackling the task. One of the logos I designed was for the GoatMeats.com site. Dusty Copeland wrote me and asked me to evaluate her site, and I replied with a brutal, descriptive evaluation. Among other things, I criticized her for not displaying Mount Shasta prominently in her site. Her farm is at near the foot of the mountain, and it provides a majestic backdrop for her pictures, but she only had it on one page, hidden deep in her site. A few months later, she told me she needed a logo for her goat meat packaging. The first thing I did was ask for pictures of the mountain. 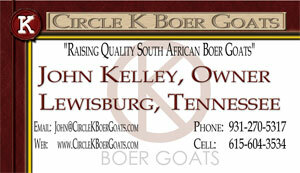 Then I took a picture of one of her goats, did some Photoshop drawing, and made a nice logo. I have done a number of other logos since then. On most of the sites I have designed, I have added a custom logo. John Kelley had a Circle K on his original site (that I thought might be a drawing one of his kids made). It turns out it wasn't, so I just made him a nice, crisp Circle K. In fact, with his, I also made a was impression Circle K - and I made him a business card. 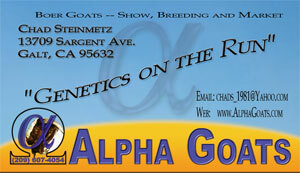 Chad Steinmetz had a nice design at AlphaGoats.com, and he wanted a better logo. I actually made him a couple (the first had a Roman letter A, but he wanted a Greek letter A. I really liked my triangle design, but Chad chose the second (if anyone out there wants a triangle logo designed with an A in it, let me know). The final design (on the right), also uses the Omega shape (something you probably wouldn't have noticed if I didn't say anything). I also made Chad a business card. On the business card, we made the mistake of putting the telephone number in the logo (and it was hard to read on the card). Also, did work for Sacred Heart Ranch. Holly Martin had business cards and magnets made, all based on her original logo. I use Vista Print for Business Card orders. Follow the link to see their offers.